Returning to Bourdeaux... next up is the . Part of the gigantic appellation, the Médoc (which in true French wine fashion, is also, confusingly, the name of the sub-appellation that covers the northern third of the region). Generally speaking, the southern two-thirds is considered the Haut-Médoc. Now pay attention: within this area are four famous villages, Margaux, St-Julien, Pauillac and St. Estèphe. I will cover each of those villages with their own wines. Most of the wine produced here is red, and is primarily cabernet sauvignon (if you remember, the Médoc is on the left bank of the Gironde). An interesting tidbit- much of the Médoc used to be marshlands, certainly not grape growing land. But in the 1600’s Dutch engineers were brought in who cut large drains in the land. By lowering the water table, riverside gravel banks were created. 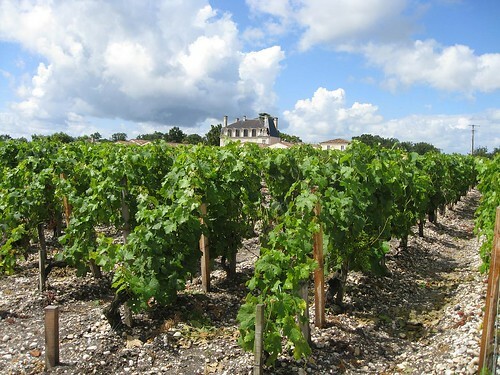 Wealthy people from Bordeaux bought land in the area and planted vines. By the end of the eighteenth century many of today’s most prestigious wineries were established. 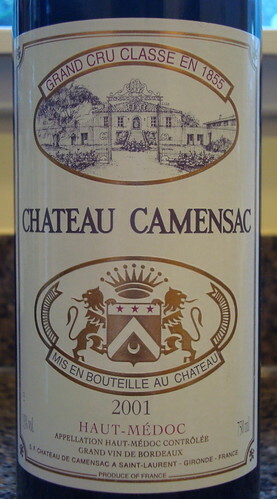 I tasted a 2001 from Château Camensac, which happens to be a fifth growth. If you remember, the Médoc is the region in which Château were classified in 1855. Because it's fairly old, the wine was dark brick red. It smelled very smokey and of toasted oak, white pepper and red fruit- maybe a bit like the defrosted raspberries I put in my yogurt parfaits each morning (I miss stone fruit season!). The wine was a bit thin and light (I’m obviously used to Napa cab! ), and was earthy. It also tasted like leather (which I’d read about, but never really experienced). It had a super long finish. Not too bad, but not too great. I decided to take a very brief detour off of Bordeaux to taste the 2010 Beaujolais Nouveau. Beaujolais is in Burgundy, but unlike the rest of red wine produced in Burgundy, Beaujolais is made from the grape, a grape that apparently doesn’t produce much of anything worth drinking anywhere else that it’s grown. I tried a Beaujolais a few months back (and didn’t enjoy it either), but this is . I’ll save the specifics on how gamay is grown and fermented (both unusual) for when I really taste Beaujolais. Given my impression from this wine and the ill-fated Trader Joe’s Beaujolais, I see that it is IMPERATIVE that I taste a Cru wine if I want to enjoy it. The wine was a magenta purplish color and was intensely fruity on the nose. It smelled almost candy-like. It was very light-bodied and had a general fruitiness, but was also the slightest bit sour. We drank almost half of this bottle before pouring it down the drain. It wasn’t horrible, certainly drinkable, but why drink mediocre wine when you can drink great wine?